Live music and comedy are coming to North Beacon Hill this Friday, June 9. 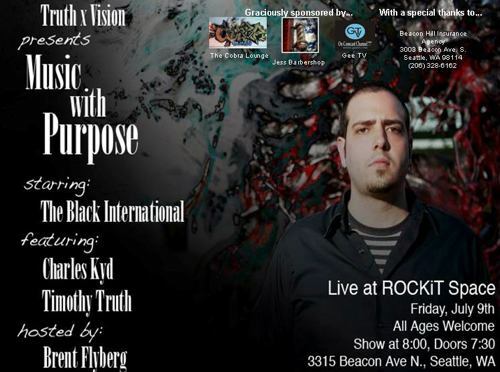 The Music with Purpose show at ROCKiT space (3315 Beacon Avenue South) will feature The Black International, Charles Kyd, and Timothy Truth, and will be hosted by Brent Flyberg. The show is open to all ages and starts at 8:00 pm (doors open at 7:30). Tickets are $10 at the door. Beacon Hill writers will also find a home at ROCKiT space on July 20 at 6:30 pm, when they gather for the first meeting of a new writers’ group. J.P. Kemmick is helping put the group together: “We’d like as many people to attend in order to help us shape what the group will look like. Hope to see you all there.” More info at the website.